being little • bristol uk fashion & lifestyle blog. : winter jungle. I bought this coat on Monday after seeing it online - they only had a size 12, and I thought it'd be better to try it on, so we popped down to our local Asda. As you can see, it fits pretty much perfectly, and I'll be able to fit a jumper underneath too, which is always useful with a winter coat! I'd been looking for a black coat for ages, and really love the 60s shape to this one, as well as the super soft faux fur collar! The length is also great, as longer styles often swamp me. 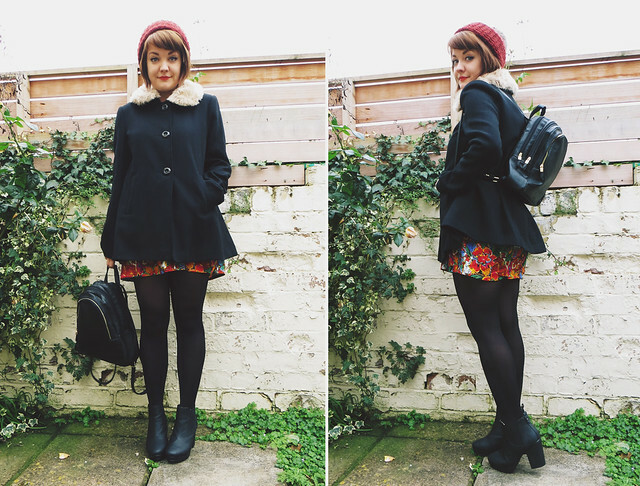 The backpack was part of a lovely gift from New Look, the rest of which I'll be blogging about soon. It feels like great quality, and has lots of pockets. I've wanted a leather-look backpack for ages, so I'm really pleased with this! I love how it looks with my boots as well. Finally, to add a bit of colour to an otherwise very black outfit, I popped on my favourite hat (which is rapidly losing its elastic!) 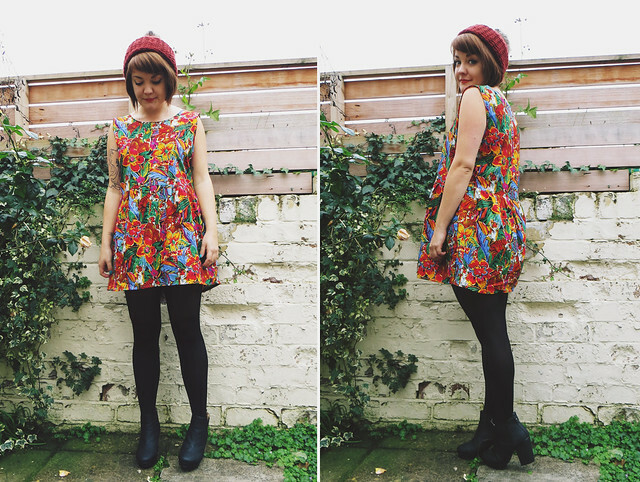 and my lovely smock dress from Vintage Style Me! Just proving the point that you CAN be colourful & wear jungle prints during the winter months! The coat is something I am currently looking for. I love the look a lot. I am in love with your coat! Ah that coat is to die for! Adorable. This coat is absolutely perfect. I love the 60s shape too and the fur collar is great. The colorful, fun dress underneath is unexpected and completely cute.